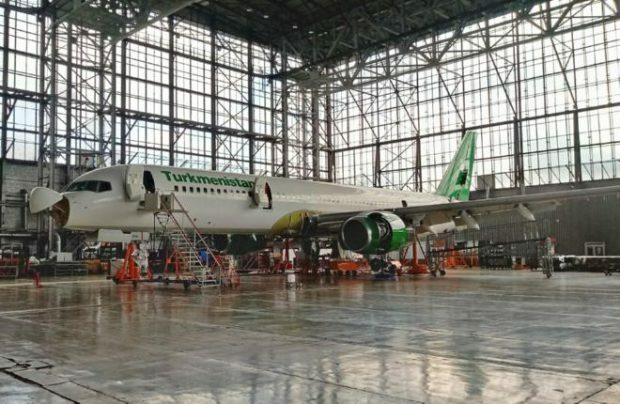 Russian MRO provider Engineering Holding has announced that its subsidiary Sibir Technics has carried out maintenance on one of Turkmenistan Airlines’ Boeing 757s. This is the first time the carrier has sent its aircraft to Russia for maintenance. The aircraft in question is a Boeing 757-200, registration code EZ-A014, which the airline has operated since 2001. It underwent a S4C-check at Sibir Technics’s Novosibirsk base, as well as a number of minor maintenance operations ordered by the carrier. The aviation authorities of Turkmenistan carried out audits on two of Engineering’s MRO bases in Russia before sending the aircraft to the country. One of the factors facilitating the approval was the provider’s possession of previously issued EASA Part 145 certificates. Stanislav Mitin, the head sales manager for Engineering Holding, told Russian Aviation Insider that the company expects to continue and expand cooperation with Turkmenistan Airlines through maintenance on the carrier’s Boeing 737-700/800s and 757-200s, of which, according to open sources, there are 12 and two respectively in the carrier’s fleet. The provider also is looking to repair Turkmenistan Airlines’ CFM56-7 engines. Sibir Technics has gained significant experience with the Boeing 757-200 over the last two years. Its customers include the Kazakh Defense Ministry, iFly, Azur Air, Aerocargo+, and others. Another new customer for Engineering also hails from Central Asia. Kyrgyzstan-based Avia Traffic Company has recently sent one if its Airbus A320s to subsidiary C7 Engineering’s base in Moscow for a C-check. The carrier’s move to send the aircraft to Russia is partially down to the fact that both countries are parties to the Eurasian Economic Union. Commenting on future involvement with Engineering, Avia Traffic Company’s technical director Aleksandr Volkovsky stated that the company is satisfied with the results, and that the possibility of future cooperation between the companies is great.